Carrabin has a roadhouse and is the rail stop off point for Westonia. An Information Bay provides things to see and do in the Westonia Shire. Meals available on premises from 10am to 8pm. 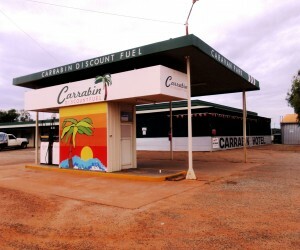 Five motel rooms with ensuite, TV, fridge and tea and coffee making facilities. Laundry available to all guests. Caravan Park consists of ten van sites. Shady grassed area with barbecue. Opening Hours: Monday to Sunday 9am to 8pm.